It’s always tough to review a first issue, especially when it has to introduce and make you care about a whole new setting, new characters and then achieve some sort of internal narrative arc all at the same time. 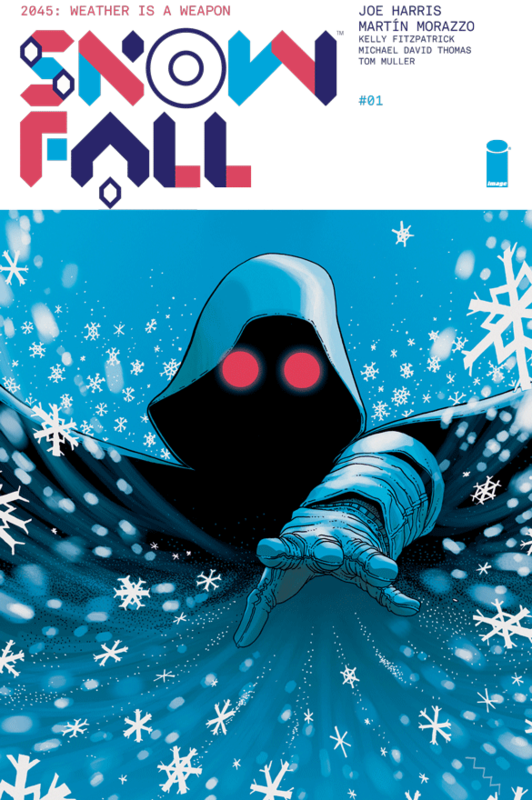 Snowfall #1 manages to do all of this without feeling overly packed and leaves you interested for more, so it manages to nail its first aim admirably. The setting of an authoritarian, corporate America a decade after a climate disaster is both topical and intriguing and we are introduced to most of our major characters in quite natural ways which give us an insight into their deeper motivations and give us hints as to just how they will factor in the series moving forward. So far so good. The dystopian setting and ‘misunderstood terrorist’ tropes come off as a little hackneyed and clichéd at first glance but there are hints in the writing that imply that there is more creativity in the offing than just a regurgitation of well trodden themes. The artwork is nice but not outstanding, with a vibrant colour palette often using pale blue contrasted with reds to good effect but never overplaying that one dynamic. I get the sense that there are prettier panels to come in the future now that we’ve got the introductions out of the way. All in all this is a solid introduction to what could prove to be a fun series.